Prototype: 3 Swedish State Railways SJ type Lgjns two axle container transport cars. Each car loaded with 2 WoodTainer XXL containers registered for the Austrian firm Innofreight Speditions Inc., Bruck an der Mur, Austria. 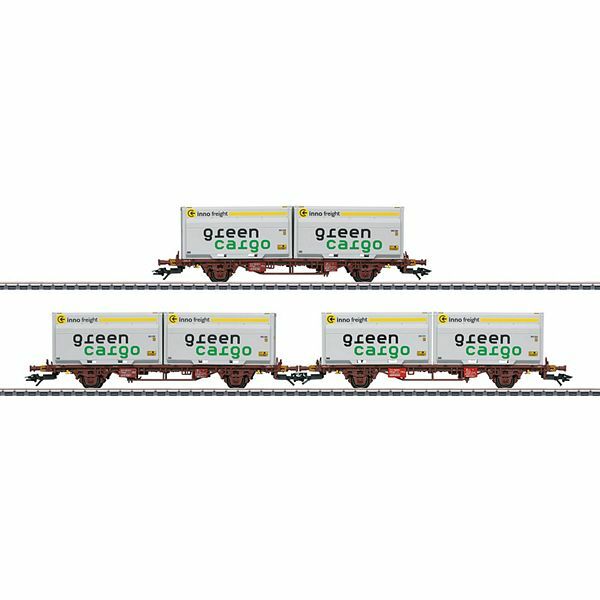 High volume containers with a capacity of 46 cubic meters, painted and lettered for green cargo, the SJ's freight service area. The cars look as they currently do in real life. Model: The transport cars have partially open metal floors. The frames have side truss rods. They also have separately applied destination boards. Each transport car comes loaded with 2 WoodTainer XXL containers. The containers can be removed. All of the containers have different registration numbers and the transport cars have different car numbers. Total length over the buffers 51.2 cm / 20-1/8". DC wheel set E700580. New car numbers on the container transport cars and new registration numbers on the WoodTainer XXL containers. Ideal cars for unit trains.